Sony Ericsson Got Hacked by Idahc - Lebanese hacker ! Again, DAMN ... Whats Going on with Sony ?.. 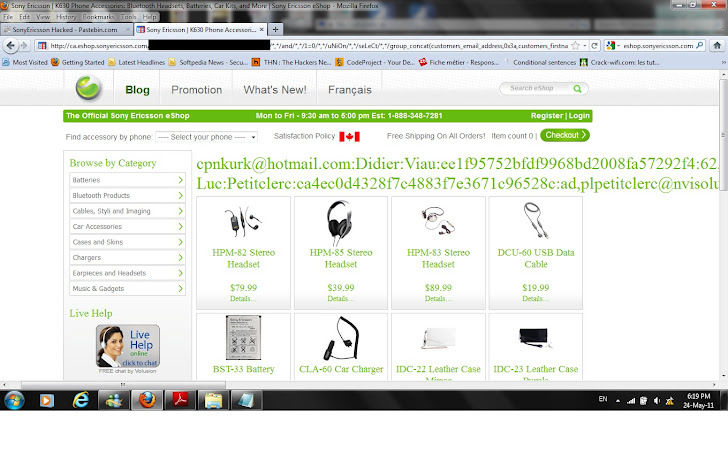 Idahc , A Lebanese hacker hack The database of ca.eshop.sonyericsson.com with a simple sql injection. Two attacks on Sony in one day. Today's Morning LulzSec Leak Sony's Japanese websites Database and Now Sony Ericsson's Eshop Database Hacked. 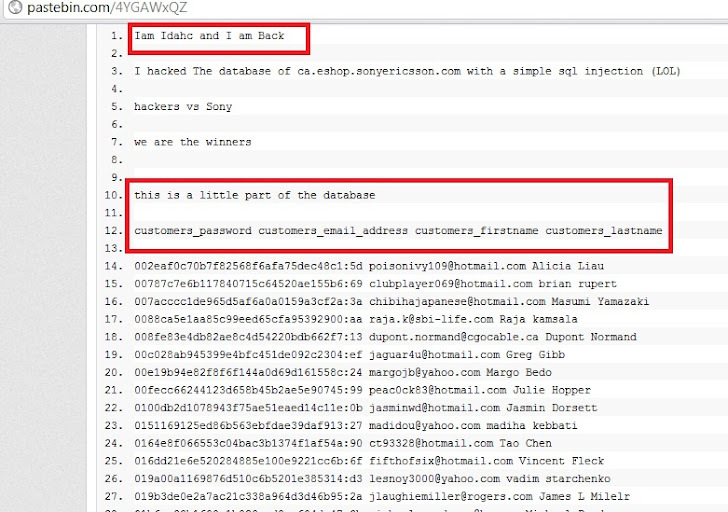 Email, Password and names of 1000's of users are exposed via text file on pastebin. The news is provided by Hacker via email that they have extract the whole database and they leak the data online via their Facebook/Twitter Accounts. The Pastebin link is http://pastebin.com/4YGAWxQZ . Now Its 10th Attack on Sony. Well Sony getting Free of cost Auditing by several hackers ,I think sony should be the most secure brand in future because their security holes out, and Now its Sony's Duty to Fix them as soon as possible. Even Now every hacker is trying to hack various Sony's sites just to get fame, because now it becomes the Hot Topic !